Those riddles have been the most prominent example of a batch of mysteries woven into a game that is correctly viewed as a shooter but that sometimes can be played as a puzzle. 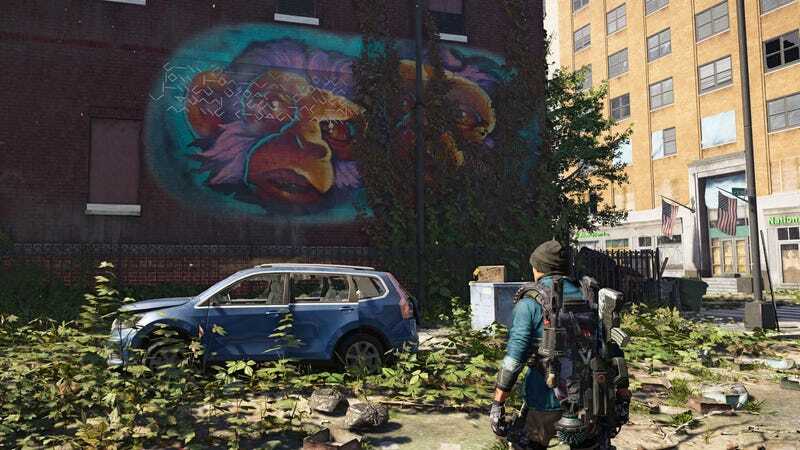 Eight riddles, all coded in a cipher text, appear in works of graffiti spread around The Division 2’s vast Washington, DC. They’ve all been cracked by now, but the community had some fun figuring them out. Look closely at the painting on the wall and you’ll see the coded message. The locations, decodings and solutions to all the riddles can be found on an image gallery maintained by Zinfinion, the player who cracked the cipher. To fully solve it, players need to find the memorial in question and salute a flagpole. Gerighty thought players approaching the riddles would find the graffiti as they played, try to crack the messages in the wall art with the help of some in-game clues, solve the cipher code and use it to descramble the riddles, ponder the meaning of the riddles, figure out what the riddles were telling them to go and do, then do it, which would trigger the appearance of an elite Hunter enemy for players to kill. That’s mostly how it worked, except for the fact that the cipher for all the graffiti riddles was cracked really fast, back when the game was in beta in February—weeks before launch. That’s when a gamer who goes by the name Zinfinion noticed some of the graffiti messages and got to work on the cipher. “I guessed a three letter word to be THE and a two letter word to be TO, that led to two different instances of ?O?TH and ?O?TH which quickly became SOUTH and NORTH and then the rest of the letters just started to become obvious,” he told me via private message in a Discord group dedicated to cracking The Division 2’s secrets. Puzzles like these might seem strange to include in a shooter, but players do tend to like tough in-game problems to solve. Bungie has excited its community of Destiny players with in-game puzzles that crop up between gunfire-filled missions. For Gerighty, the puzzles allowed his team to present a tonal shift in how people could play the game. Gerighty acknowledged that The Division 2 usually tells you what to do by doling out mission objectives and articulating your available tasks, often with prompting from the fictional in-game guidance gadget ISAC, or Intelligent System Analytic Computer. “With the riddles, Contaminated Areas and even the SHD Caches, we wanted to prompt players to stop, take a breath, and look at the space with their own eyes instead of ISAC’s,” he said referring to the more exploration-related aspects of the game. Contaminated Area are areas that require some ingenuity for the player’s character to reach and are sprinkled with audio logs. SHD Caches are collectibles that are marked on the map but also require some detective work to figure out how to reach.